Awfully Chocolate’s Christmas Hamper is sleek and beautiful. The textured black box embodies elegance, and the hamper is presented with a red ribbon and gift tag. This is surely one gift to impress. And it solves the problem of gender preference if you are buying this for generic gift exchange; anyone would be happy to receive this, and everyone else would just be upset that they weren’t your secret elves. The star of the show is definitely the Chocolate Marquise Cake. Instead of their usual classic All Chocolate Cake, this year’s hamper comes with an understated Chocolate Marquise Cake. It is a rich and extremely intense chocolate cake swirled with more chocolate. Yes, this cake is even richer than their Superstacked Cake and is no less decadent. The cake (12 inches diameter) is good for an average of 20 guests. The next thing you can look forward to is the Ganache Truffles. Fresh, dark chocolate truffles filled with luscious chocolate ganache sits beautifully in a slide-out box. Bite into a truffle and you will be greeted with smooth and rich chocolate ganache that will dazzle your heart. We fell in love on first bite and it is probably the next best thing in the hamper. The Salted Butterscotch Brownie has been around for years and it is definitely a crowd favourite. We like the brownies warmed up for a bit in the oven and topped with a scoop of ice cream. In this hamper, you get a full-sized brownie, cut up into 9 bite-sized portions with adorable spatula forks. Warm them for no more than 10 seconds in an oven or microwave and the result is to-die-for. 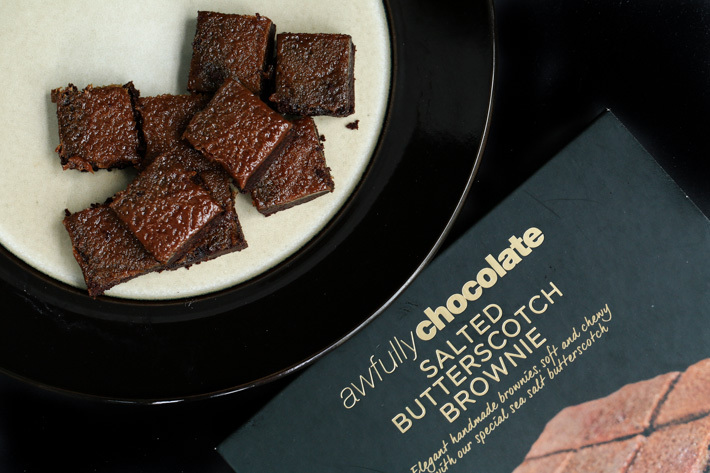 The butterscotch combined with the rich chocolate brownie base is a match made in heaven. What is Christmas without some tasty cookies? The idea of having rustic cookies throughout the Christmas period, especially Chocolate Chip Cookies, warms our heart. In the hamper, you get two different types of cookies—Artisanal Chocolate Cookies in Double Chocolate Chip and White Chocolate Macadamia Cookies. The former has generous and even amounts of chocolate throughout each bite. The White Chocolate Macadamia Cookies is a sweeter option with macadamia nuts and white chocolate. Awfully Chocolate is one of the best chocolatiers around in town; of course, they would create some pretty mean chocolate bars. There are three in total in the hamper—Smooth Milk, Bittersweet and Very Dark to suit every preference. Well, people are obsessed with #legsfordays, but we just want our wine. Every hamper comes with a bottle of Egot Merlot Sangiovese. You’d be surprised; Merlot actually goes extremely well with chocolate! The Christmas Hamper must be ordered at least 3 days in advance. Prices are inclusive of GST. Delivery charge at S$10.70 per location. This post is brought to you by Awfully Chocolate.